Faro Airport is the Algarve’s regional airport, connecting the Algarve with airports in the UK, Germany, The Netherlands, France, Ireland, and elsewhere. Regardless of where you’re staying on the Algarve, whether it’s Albufeira or Aljezur, this is going to be your nearest airport. You can also fly into Lisbon Airport, which is just under three hours away by car, or Seville Airport which is a similar distance, but Faro Airport is generally the most convenient airport to fly to. Faro Airport is located just under 7 km from Faro City Centre, a small city with a population of around 50,000. Although it is on the Eastern Side of the Algarve near Spain, it doesn’t take long to get anywhere on the Algarve by car. How do I get to and from Faro Airport? What’s there to do at Faro Airport? What hotels are near Faro Airport? There are several ways to get to and from Faro Airport including by airport transfer, public transport, taxi, or by renting a car. There are plenty of companies that offer airport transfers from Faro Airport to hotels and resorts throughout the Algarve. You can either organise a transfer when you arrive at the airport, or book it in advance. Hoppa.com is a popular website that allows you to compare the cost of airport transfers. Depending on where you’re going to on the Algarve, it usually gives a few different options including an airport shuttle, private cars, people carriers, minibus, or coach. Faro Airport, unfortunately, doesn’t have a direct rail or bus connection: you have to go info Faro City Centre first (bus #16), and then take a bus or train onto wherever you want to go. While there is a rail line that runs between Faro City Centre and some of the other towns on the Algarve – including Silves, Portimão, and Lagos – it doesn’t connect to most of the popular towns and resorts on the Algarve. You can take the train to the nearest station, but you’ll probably need to get a taxi to take you onto your hotel or resort. If you’re going to Albufeira, for example, you can take the train to Ferreiras which is around 5 km from Albufeira itself. You can then get a taxi from Ferreiras to Albufeira. Taxis are also available at Faro Airport, and you can book a taxi to your resort or hotel from Faro Airport. Uber and some other taxi apps are also available, and are likely to be cheaper than a taxi. If you’re planning on exploring some of the different towns on the Algarve, it probably makes sense to rent a car and to pick it up when you arrive at Faro Airport. There are a number of different car hire companies located at Faro Airport, including Europcar, Avis, Budget, Hertz, Sixt, and Thrifty. You can compare them against each other using a site like rentalcars.com, both in terms of price but also local reviews i.e. reviews from people who have rented from their Faro Airport branch. Faro Airport has all of the essentials that you need at an airport: a handful of restaurants and cafés, some shops, free Wi-Fi, and a Duty Free Store. There’s also a small paid-access airport lounge, if you want to escape the crowds. This isn’t a particularly big airport (it’s not the kind that has a gym or a cinema in it), so it’s not the kind of place you want to spend too much time in. 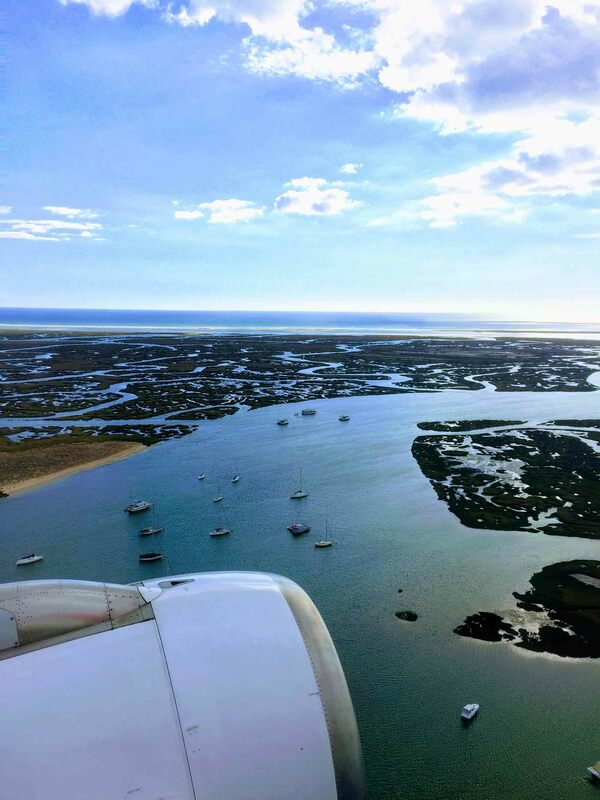 If you have a layover or stopover here, or you just have a long wait between checking out of your accommodation and your flight, it could be worth taking a taxi into Faro or to the nearest beach (Praia de Faro). You could also spend a few hours at one of the nearby shopping centre. The Algarve’s newest and biggest is Mar Shopping, which is around 15 minutes’ drive from Faro Airport. This has plenty of shops, restaurants, and a cinema. There’s also the smaller Forum Algarve, which also has a cinema and is slightly closer, that’s 8 minutes’ drive from Faro Airport. If you want to stay near Faro Airport, there are a few hotels that are nearby. Most you’ll need to take a taxi to get to, but at least one is walkable. See the guide to hotels near Faro Airport for more information. Have you flown to or from Faro Airport? Have any tips or recommendations? Share your thoughts and reviews by leaving a comment below.